The Children's Holocaust Museum at Whitwell, TN. Photo: Brent Moore. A paper clip is a seemingly simple, unassuming, functional object. Useful, but not overly important. For the students at Whitwell Middle School, however, paper clips have become a great deal more than simple office stationery. They are a symbol of an era that should never be forgotten. Whitwell is a very small town in Tennessee, and, like many small rural towns, not very diverse. At the time of the Paper Clip Project in 1998, the Whitwell Middle School had only 425 students, most of them white and none Jewish. The project began as an idea for a class, a way to teach eighth graders about intolerance and the evils of prejudice. And so, a course on the Holocaust was organized. It was voluntary, and meant to teach the students about tolerance and respect for other cultures. As the students engaged with the class, they were overwhelmed by what they were learning about the Second World War, Hitler, and his “Final Solution to the Jewish Problem.” The sheer number of people murdered simply for being Jewish was hard to grasp and visualize, so the students went first to their teacher, and then to their principal, Linda M. Hooper, to ask about starting a collection. They wanted some kind of visual representation of the millions of Jews killed. Principal Hooper agreed, if they could find something that had real significance to the project. The class started researching, and made an interesting and unexpected discovery. In Norway, a Jewish man named Joseph Valler had invented a version of what we know today as a paper clip, and in a public display of protest against the Nazis and the atrocities of the Holocaust, many Norwegians quietly wore these clips on their lapels. This was exactly the symbol the students sought to represent those Jews killed during the Second World War. They began collecting paper clips, one for every Holocaust victim. Hoping to spread the word of their project to a wider audience, they wrote to celebrities and politicians, asking for paper clips and for stories behind any donations. Before long, the collection grew into the millions, far exceeding the six million Jewish adults and children murdered. And it wasn’t just paper clips they received—over 30,000 letters, documents, and other materials were sent to Whitwell Middle School. The students catalogued them and created a Holocaust Memorial Research Room in their school. 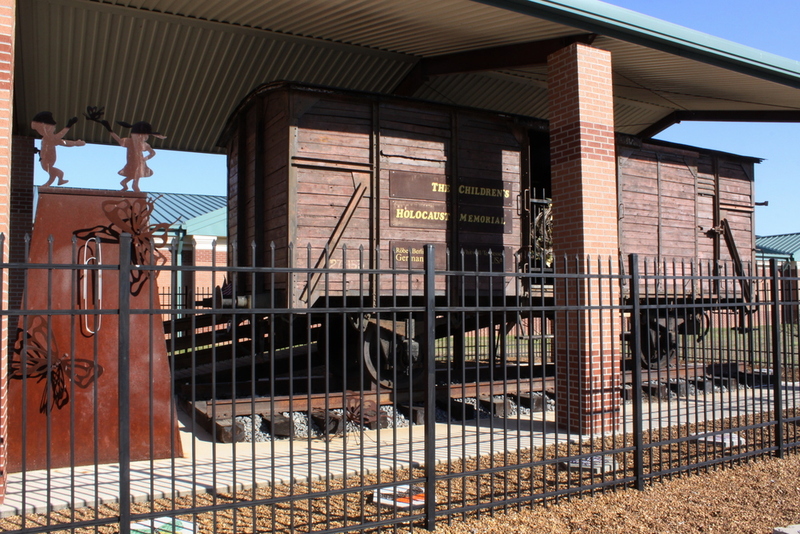 The paper clip collection is housed in a German railcar used in the Second World War to transport Jewish people to concentration camps and near-certain death. It was in a railroad museum in Germany when it was purchased by Peter and Dagmar Schroeder (later the authors of two books about Whitwell’s Paper Clip Project), and given to the school to become the Children's Holocaust Memorial. Images and ornaments of butterflies—a symbol of life and renewal—have been placed on the grounds around the memorial, and are sometimes added to by those who pass by. The railcar, which once symbolized death, is now an emblem of remembrance, while the paper clips make concrete the identity of those killed. The car holds the clips personifying the adult victims; a statue was created for the children who perished. As a result of the Paper Clip Project, films have been made and books have been written. Students now give tours of their Holocaust Memorial, hoping to inspire those who visit to work towards a world where such horrors can never happen again. Being a Roger E. Joseph Prize [winner] exemplifies what my community is all about. As I look at the life of Roger Joseph, I think about what he overcame and the choices that he made. At an age younger than some of you who are becoming rabbis today, he chose not to let polio take his life away. He chose to do good and be the kind of person that he thought his God wanted him to be. And you today have made a choice, to go out and serve your god and serve to other people. And for that I am truly grateful. I would just ask you today as you leave here to think about the paper clip, a tiny insignificant thing, and to think about your choices and I would ask you to join with the students, staff and community of Whitwell, Tennessee in creating a world where acceptance and respect become the rule and not the exception.